What moves you ... Helping individuals manage and overcome life issues and guiding them to better mental health? The Master of Arts in Clinical Mental Health Counseling, offered online or on-campus, prepares you to pursue fulfilling licensed-counseling employment in a variety of professional settings. This CACREP-accredited, mental health master's program combines models and techniques of counseling with biblical principles for a strong and balanced approach to mental health counseling. Build relationships and get feedback from a small but challenging core of fellow students and professors. Apply what you learn from your rigorous coursework through qualified internship settings. Apply knowledge and skills in human growth and development, group work, research and professional ethics. Diagnose and treat people with emotional and mental health disorders. Practice techniques and interventions to treat people impacted by crisis and trauma. Prepare for real-world clinical practice in community agencies and other mental health counseling service networks. Addresses the foundations, contextual dimensions, and basic knowledge and skills to function in specialized settings of agency, community and emergency environments. Emphasis will be placed on providing intervention in clinical, disaster, crisis and traumatic situations, including emergencies in which triage, intervention, support, referral and advocacy is required. Specialized areas will include counselor self-care; wellness and preventions; suicide de-escalation, crisis incident stress management, and psychological first aid. Addresses treatment planning within the therapeutic process, guiding principles for the selection of effective treatment strategies, and best practice and evidence-based treatment approaches to mental health care. Emphasis will be placed on a practical progression to effective clinical care (e.g., intake, therapeutic rapport-building, assessments, goal setting, treatment planning, and documentation). Cross-listed with CES 664. Prerequisites: COUN 521, COUN 526, and COUN 538. 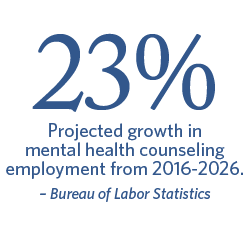 Be assigned to work at a professional counseling work setting, closely supervised on site by a trained mental health professional. Culminating experience to apply the knowledge and experience gained during counselor training program as a member of a professional mental health team. In addition to supervision on site, participate in a weekly internship seminar led by a professor on the counseling faculty. Prerequisite: Permission of Instructor. Pass/No Pass.